Lesson Study is an intensive professional development model in which teachers learn through a process of planning and observing lessons together. Originating in Japan, lesson study involves systematic inquiry into teaching practice. Stigler and Hiebert (1999) describe lesson study as a way for teachers to look at their own practice “with new eyes”. Lesson study has proved to be a powerful experience for teacher, because it “is embedded in the classroom and focused on students, it is collaborative and ongoing, and it is based on teachers’ own concerns and questions” (Darling-Hammond & McLaughlin, 1995). In this way, lesson study is a teacher-led or teacher-initiated activity that has the potential to increase research-based knowledge that is critical to improving instruction (Lewis et al., 2006a). Teachers “engage in lesson study as researchers and scholars of their own classrooms. Their inquiries honour the fascinating and complex nature of teaching” (Stepanek, 2001). Like other forms of collaborative research, lesson study is a straightforward idea, but a complex process, requiring the commitment of teacher participants over a sustained period of time and an openness to learn about subject matter and its teaching and learning (Lewis et al., 2006b). Four critical components of lesson study have been identified: goal setting, planning, implementation and debriefing. These components are derived from the lesson study cycle outlined in a seminal article by Lewis, Perry and Murata (2006). Teacher participants begin by setting a goal for their students that they are aiming to address in their lesson. This is often something that is difficult for the students to learn, or difficult for the teachers to teach. In other words, “the desire to improve is stimulated by seeing what’s not working” (Lewis et al., 2006b). Goal setting leads to an exploration for the best instructional strategies that could be used to achieve the goal (Fernandez, 2002). 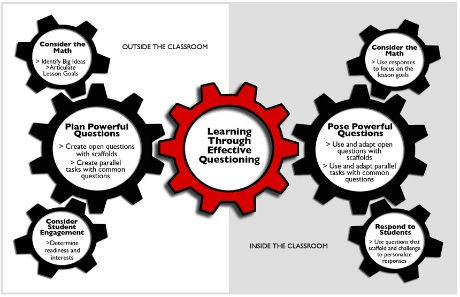 During this planning stage, the teacher participants need access to outside sources of knowledge – both print (e.g., textbooks, innovative materials, outside research articles) and human (e.g., outside educators, content specialists, researchers). The lesson is taught by one of the team members while others observe, and a detailed debriefing session and reflection takes place. This debriefing period drives the continuation of the cycle as the next set of goals is established. These final phases of the cycle – implementation / reflection / debrief – should feel less like a final performance and more like a catalyst for further study and improvement of practice (Lewis et al., 2006b). Our research has allowed us to observe teachers engaging in additional complex stages beyond these four steps. Researchers asked teachers to list the tasks that took place during the lesson study cycle with specific attention to how their time was spent. The diagram reflects our understanding of lesson study based on the research – the teacher activity that takes place during and between the formal phases of the cycle. The informal or "backstage activities" that occur between the formal phases are a significant addition to our understanding of what takes place for teacher-participants as they move through the cycle. As researchers, we recognize these in-between activities as essential building blocks of a successful lesson study cycle and as representing the real work and commitment of teachers as they support one another through lesson study. to implement changes in their practice based on their findings. they aim to improve their practice and student learning (Sagor, 1992). Action research has been shown to be an effective form of teacher professional development that enables teachers to closely examine issues of student learning and teaching practice (Bevevino, M.M. & Snodgrass, D.M., 2000; Hubbard & Power, 1999; Newman, 2000). Collaborative action research refers not only to teachers working together, but to teachers and researchers working together to conduct classroom research. Ross, Rolheiser and Hogaboam-Gray (1999) defined collaborative action research as “a systematic inquiry into teacher practice that is conducted by a team of teachers and university researchers working as equal partners” (256). Results from the collaborative action research contribute to the collective knowledge of teaching and learning and are shared with others with an eye to improving education practices (6). 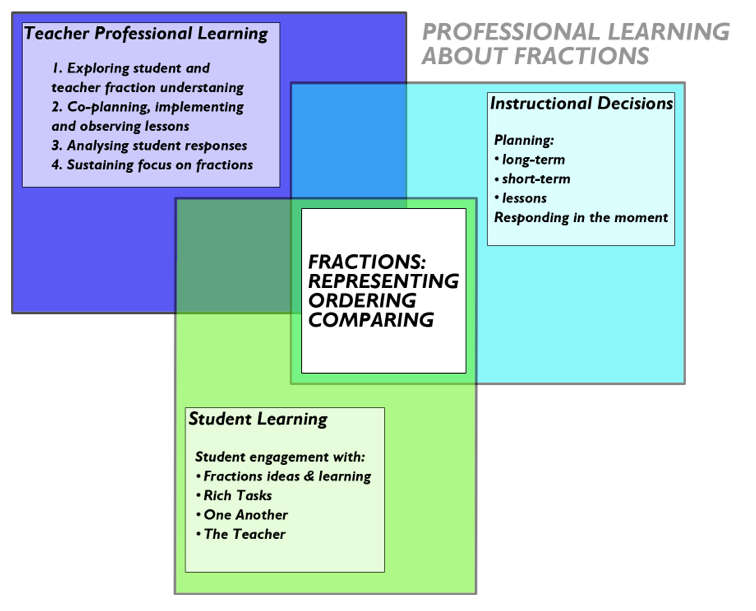 For three consecutive years, from 2007 to 2010, the Elementary Teachers’ Federation of Ontario invested in the professional development of its members through a collaborative action research initiative – called Teachers Learning Together – where university researchers were partnered with self-identified teacher teams across the province. Researchers at the University of Windsor, Brock University, Lakehead University, Nipissing Univeristy, the University of Toronto and Trent University were engaged to work with 8-9 teacher teams each; these teams had submitted research proposals on specific topics that they were interested in investigating through the Teachers Learning Together project. The Trent University research team (comprised of Dr. Catherine Bruce and Janice Mackenzie in 2007/2008, and Dr. Catherine Bruce and Tara Flynn from 2008 to 2011 and Rich McPherson 2009 to 2011, along with quantitative researcher Dr. John Ross of the University of Toronto) supported and conducted research with a total of 26 teacher teams representing 117 teachers. This digital research paper is based on the work of the Trent teams. In the last two years of the project, teams submitted proposals focused specifically on areas of math instruction that they wanted to research in their classrooms. This multi-year, large-scale collaborative action research project is unique in the history of action research in Ontario, and indeed Canada. This study documents classroom-based action research through collaboration between: a) The Elementary Teachers’ Federation of Ontario (ETFO); b) district school boards in Ontario; and c) researchers at Trent University. In our intensive work with teacher teams over several years, we have found the process of collaborative action research to lead to powerful learning – for us (the researchers), for teachers, and ultimately, for students. What is a Digital Paper? Video documentation has become an integral component of data collection in educational research. Video episodes are viewed, clipped, analyzed, transcribed and analyzed again. And yet when it comes to writing up findings, researchers are typically forced to describe the visual nature of their data; the reader does not have access to the data and is unable to see the video itself, resulting in a “flattening” out on the experience of what was a lively, dynamic, and engaging process. Digital video is now emerging as a powerful engagement and portrayal tool; one that is helping teachers to connect with and improve their understandings and interpretation of their practice (Carraher et al., 2000; Pea, 2003). In 2004, Olivero et al. developed a format called videopapers. A videopaper is a marriage of the traditional paper written by researchers and academics (but not exclusively so) and videotaped classroom footage of teachers and students working in real classroom situations. Combining the video with the text creates a fluid document that is more explicit than the text or video alone. Building on Olivero’s videopaper work, in an attempt to bring video-based research to life, we have generated a conceptual and virtual framework called Digital Papers. Digital papers is a web-based tool, that allows researchers to show their findings alongside video clips, transcripts of the video clips, and conceptual models that frame their work. It is the conceptual model that drives the digital papers and distinguishes them. The diagrams are interactive and frame the ideas of the digital papers so that viewers control their experience through the diagram, navigating through a complex series of layered screens with ease. A second distinguishing feature is that our digital papers focus on one key concept (e.g., Engaging Students in Math Talk) or research story (e.g., Lesson Study as a PD Process). Digital papers were developed by Dr. Catherine D. Bruce, an Associate Professor at Trent University’s School of Education and Professional Learning, along with teacher-researchers Tara Flynn and Rich McPherson, also associated with Trent University and the Trent Math Education Research Collaborative (TMERC). The research team is collaborating with a development team at the Ontario Ministry of Education to increase capacity and production. Download our Collaborative Action Research iBook and share it with your colleagues! © Bruce, Flynn, McPherson (2009), Digital Papers.